Customized white checkered glasses will make the heads turn wherever a wearer goes and it is definitely going to put your brand into limelight! This sunglass is distinguished by its checkered frames surrounding lenses, dark lenses and plain temple frames – which altogether cut a very retro appearance. These checkered sunglasses are massive at party scenes, where people are finding ways to get themselves noticed. 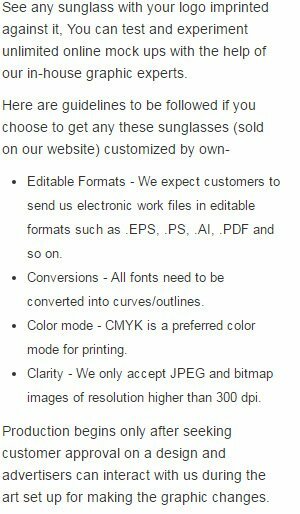 Advertisers who are craving for attention from the right people can always hand over logo or other symbol imprinted promotional white checkered glasses to them. Whoever sees a person wearing personalized white checkered glasses at a party or some other social events are bound to come closer and see the name imprinted over the frame. This means your business credentials are going to hog limelight during parties, and other social events, where big turnout is expected! Imprint Area: 2" x 3/8"